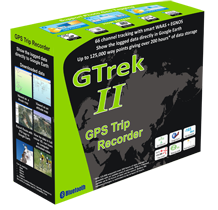 GTrek II is now available as an update to v2 software. If you are a registered user click on "Software Updates" link below and download this code now. Perfect for skiers, and snowboard enthusiasts both amateur and professional, the product uses GPS satellite technology and records the users' exact position at specific intervals, to build up a picture of movement.